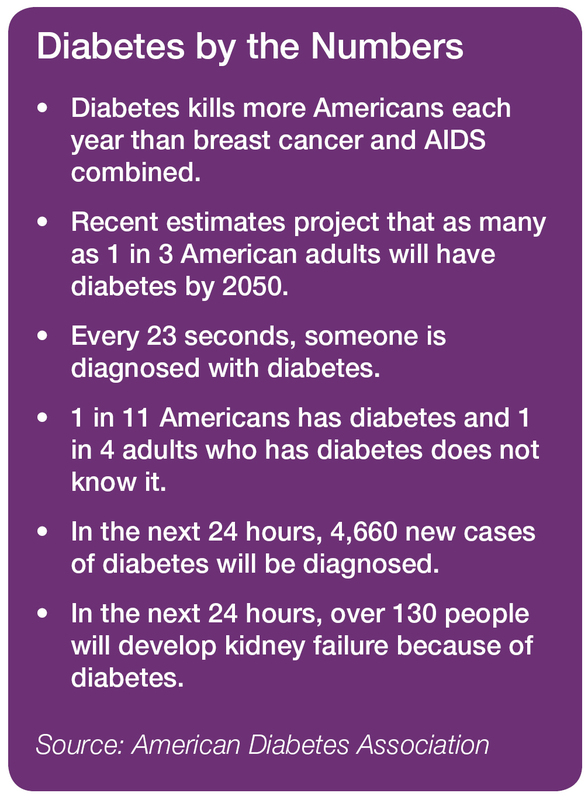 November is American Diabetes Month. Diabetes is a disease in which blood glucose levels are above normal. Most of the food we eat is turned into glucose, or sugar, for our bodies to use for energy. The pancreas makes a hormone called insulin to help glucose get into the cells of our bodies. When you have diabetes, your body either doesn’t make enough insulin or can’t use its own insulin as well as it should. This causes sugar to build up in your blood. Diabetes can cause serious health complications including heart disease, blindness, kidney failure and lower-extremity amputations. Diabetes is the seventh leading cause of death in the U.S. In Type 1 diabetes, the body does not make insulin. This is a problem because you need insulin to take the sugar (glucose) from the foods you eat and turn it into energy for your body. People with Type 1 diabetes need to take insulin every day to live. Type 1 diabetes is usually diagnosed in children or young adults. In Type 2 diabetes, the body does not make or use insulin very well. You may need to take pills or insulin to help control your diabetes. Type 2 is the most common type of diabetes. Pregnant women sometimes get this type of diabetes. Most of the time, it goes away after the baby is born. But even if it goes away, these women and their children have a greater chance of getting diabetes later in life. Excess sugar can injure the walls of the tiny blood vessels (capillaries) that nourish your nerves, especially in your legs. This can cause tingling, numbness, burning or pain that usually begins at the tips of the toes or fingers and gradually spreads upward. Left untreated, you could lose all sense of feeling in the affected limbs. The kidneys contain millions of tiny blood vessel clusters that filter waste from your blood. Diabetes can damage this delicate filtering system. Severe damage can lead to kidney failure or irreversible end-stage kidney disease, which may require dialysis or a kidney transplant. We know that physical activity and keeping a healthy weight is a good way to keep you heart healthy. But it can also help you take care of your diabetes and prevent diabetes complications. Physical activity helps your blood glucose stay in your target range. Even a 10 or 15 pound weight loss makes a difference in reducing the risk of diabetes problems. Physical activity also helps the hormone insulin absorb glucose into all your body’s cells, including your muscles, for energy. Muscles use glucose better than fat does. Building and using muscle through physical activity can help prevent high blood glucose. If your body doesn’t make enough insulin, or if the insulin doesn’t work the way it should, the body’s cells won’t use glucose. This causes your blood glucose levels to get too high, causing diabetes. Many kinds of physical activity can help you take care of your diabetes. Even small amounts of physical activity can help. You can measure your physical activity level by how much effort you use. Doctors suggest that you aim for 30 to 60 minutes of moderate to vigorous physical activity most days of the week. Children and adolescents with type 2 diabetes who are 10 to 17 years old should aim for 60 minutes of moderate to vigorous activity every day. Your doctor can tell you more about what kind of physical activity is best for you. He or she can also tell you when and how much you can increase your physical activity level. Not all physical activity has to take place at the same time. You might take a walk for 20 minutes, lift hand weights for 10 minutes, then walk up and down the stairs for 5 minutes. How Can You Learn More about Diabetes? Take classes to learn more about living with diabetes. Mercy Health System offers free diabetes classes regularly throughout the year. To find a class, go to the Events page of our website. Join a support group—in-person or online—to get peer support with managing your diabetes. Mercy Health System also offers regular diabetes support groups, which are free and require no registration. Sources: National Institute of Diabetes and Digestive and Kidney Diseases, American Diabetes Association, Centers for Disease Control and Prevention and Mayo Clinic.